CPCC Theatre is happy to announce the cast of They’re Playing Our Song by Neil Simon, Marvin Hamlisch and Carol Bayer Sanger. America’s premier funny man, Neil Simon, and the Tony Award-winning composer of A Chorus Line, Marvin Hamlisch, and songwriter Carole Bayer Sager collaborated on this hit musical about their own up and down relationship. A funny, romantic show about an established composer and his relationship with an aspiring young female lyricist, They’re Playing Our Song shows how professionally, their relationship works beautifully-but ultimately leads to conflict on the home front. Of course, there’s a happy ending. Tickets are available at the SunTrust Box office at 704-330-6534 or online at tix.cpcc.edu. New this year is a $5.00 ticket for students at any college or high school in the area. Just present a valid ID at time of purchase. Only one ticket per customer. CPCC Theatre 2014-15 Season Tickets Now on Sale! 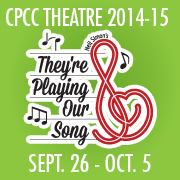 Season subscriptions to the CPCC Theatre 2014-15 season went on sale today! Check out the details for show and times under the Shows link above. Then contact the SunTrust Boxoffice at 704-330-6534 or go online to tix.cpcc.edu to order your season subscriptions today. CPCC Theatre will hold auditions for the Neil Simon and Marvin Hamlisch musical They’re Playing our Song Monday August 11th and Tuesday August 12th at 7:00pm in the Halton Theatre on the Central Piedmont Central Campus. Roles are available for 4 men and 4 women. Bring sheet music in correct key to sing 16 bars. An accompanist will be provided. Cold readings from the script will follow a brief dance audition. Rehearsal begins August 18th. Rehearsals are Sunday through Thursday evenings. Performances September 26th trhough October 5th. For more info click on the Auditions link above or email tom.hollis@cpcc.edu.